I saw this billboard along Gil Puyat (Buendia Ave) in Makati City going towards Taft Avenue. It was a simple ad. I hope God didn't have to place an advertising fee for that. Just a thought... 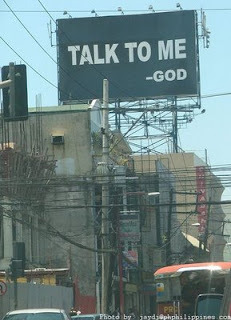 If He did, it's like God needs to compete with other more flashy ads for our attention. Kinda sad but sometimes it's true. Wow, a simple message yet it sends out a message to everybody. There's a lot of ways to talk to God, He doesn't required as to communicate with him 24 hrs, just a little prayer and thanks would be enough for each day He has given us.